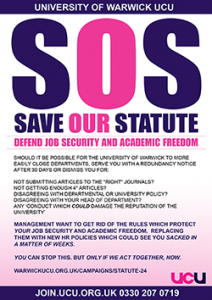 Last year, the University announced plans to gut its employment statute, Statute 24, thus putting at risk Warwick staff’s job security and academic freedom. Thanks to the mass-mobilization of UCU members, we have won important victories – Senate chose not to approve the reforms at its meeting last June, meaning that they did not go forward to Council. However, the fight is far from over. In the most recent volley, the Provost published an update on 18 December 2017 on the University’s intranet. UCU sets out below its response to the points made by the University. It is hoped that as a consequence of more streamlined employment processes, the University will be able to review its contractual offering for academic staff with a view to reducing dependency on fixed term and casual contracts. If we make it easier to dismiss people on permanent contracts, we might be willing able to offer permanent contracts more often. Once again, the University’s interpretation of fairness is about levelling down rather than levelling up. By implying that our current statutes are the cause of an increased reliance on casualized contracts, the university presents these developments as inevitable. It therefore fails to acknowledge that the increase in these forms of working is a direct result of choices which have been made by university management, and in the broader context of attacks on publicly-funded higher education teaching and research. UCU wishes to make clear that the University has made no offer of any concessions on casualization. We therefore view the University’s statement as a lazy and cynical attempt to create divisions within our membership and within the university more widely. We’ll offer our employees no more than the minimum protections enshrined in employment law. We want to make it easier and quicker to dismiss members of staff either by redundancy or through disciplinary processes. The University’s latest statement made no mention of its proposals on disciplinary and redundancy, preferring to concentrate on the issue of academic freedom. UCU welcomes the fact that the University is at least acknowledging the threats its proposed changes pose to academic freedom seriously, though this should not obscure the fact that UCU has repeatedly advised the University that we cannot agree to the proposed documents for redundancy and disciplinary. Without proper protection in place against redundancy and disciplinary procedures, assurances about academic freedom are meaningless. Casualization undermines academic freedom as precariously-employed academics feel pressures to avoid controversial areas of research and publish in particular journals and with particular publishers. Without job security, there cannot be academic freedom. a Committee could be established, to determine whether academic freedom had been infringed prior to the instigation of any disciplinary/grievance proceedings. In the case of redundancy proceedings affecting academic members of staff, the Committee would determine at an early stage whether the proposed redundancy pool and criteria represented an infringement of academic freedom. All cases of academic redundancy involve questions of academic freedom. We should be free as academics to pursue research into topics which are not currently fashionable. There are many cases of research generating significant outputs only after many years. Such work would be wiped out at a stroke with the imposition of a short-term audit culture. The consequences of this are all too evident elsewhere in the sector as the situation at Essex demonstrates (sign the petition here: http://speakout.web.ucu.org.uk/university-of-essex/). Issues of performance inevitably involve questions of academic freedom. Telling academics that they must publish in certain outlets itself transgresses academic freedom. The UCU calls on the University to ensure academic freedom by providing job security, lessening its reliance on insecure and badly-paid contracts, and treating its casualised workers with respect. The matter of Statute 24 has been brought to my attention and I am extremely concerned by any possible plans, brought by the administration at Warwick University, to vary the protections afforded by it. I will plan to raise this with the Vice Chancellor, Stuart Croft, when we are able to meet and I hope this will be in the very near future. As outlined in Tuesday’s EGM‎, the University of Warwick Senate was meeting yesterday and amongst the issues being considered was Statute 24. A number of members have emailed us asking what was the outcome. Please note this is not an official update but we have been informed that, based on the outcome of Assembly, Senate has decided not to approve the proposals as they stand, and not to recommend their adoption by Council in July. Instead, we are told that a sub-committee of Senate will be formed to look at the proposals and only after this has reported will Council consider sending any revised statute to the Privy Council. Obviously this is subject to official confirmation. If our understanding is correct, then UCU believes this decision is a step in the right direction. UCU will be encouraging management to engage meaningfully over the Statute, Ordinances and Policies in the near future. A huge thank you to everyone who has been involved in this, to all the people who have signed the petition, to members and non-members who attended and voted in the Assembly, departments who put forward motions (and the staff who took time out of their schedules to write these and provide UCU with a detailed analysis of the reforms). The fight is not over but, at the least, we have created more time for the changes to be scrutinised more fully and, hopefully, improved by the University for the benefit of the whole academic and student body. On Tuesday a strong turnout at EGM saw members overwhelmingly support an amended motion rejecting the University’s latest proposals for Statute 24, the associated Ordinances and Policies. The vote is a clear message to the University that what is currently on the table remains far below the sort of terms and conditions that our members would expect at a university which aspires to be world-leading. The full text of the amended EGM Motion can be read here. Warwick UCU has received the following letter of solidarity from the Coventry TUC which is very heartening. I am writing on behalf of Coventry Trades Union Council to provide fraternal greetings and send a message of solidarity in your ‘Save Our Statute’ campaign. Coventry UCU let us know about the new Vice Chancellor Stuart Croft attempting to repeal Statute 24 that provides your members with protections, particularly in a redundancy situation. This is a clear attack on staff terms and conditions and job security at Warwick University. If this is allowed to go through then it’s highly likely these moves will be emulated throughout the Higher Education sector in general. Sadly it has become common for today’s employers to lead a race to the bottom, treating employees as a commodity rather than as individuals that deserve respect. We condemn this kind of attitude and whole-heartedly support your campaign to defend Statute 24. We understand that you are circulating a petition for lecturers to sign. Most of our affiliated branches aren’t lecturers but they would like to show their support. We would be happy to circulate the petition to the wider Trade Union movement in Coventry. Please let me know if this is something you would like us to do. Our delegates would also welcome hearing a report directly from your members. We will be meeting on Thursday 15th June and Thursday 20th July. If you would be able to send a representative to one of those meetings please let me know and I will make sure your report is included on the agenda. We would appreciate it if you would let us know how your campaign progresses. If the campaign needs to be stepped up then we will provide whatever support we can to your branch. 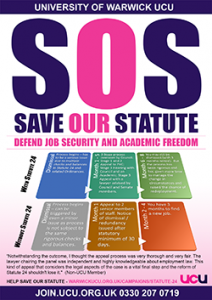 Coventry University UCU expresses its solidarity with our colleagues in Warwick UCU in its ‘Save Our Statute’ Campaign. This campaign concerns the way the University Management at Warwick are currently seeking to remove Warwick University’s ‘statute reforms’; which involves the repealing of current provisions for redundancy, discipline and dismissal. These changes makes it quicker and easier to sack and discipline members of staff at the University. This is a clear attack on staff terms and conditions and job security at Warwick University. If this is allowed to go through these moves will be emulated throughout the Higher Education sector in general. We see these initiatives as part of a developing approach by University Senior managers in which they have ceased to see themselves as not publicly accountable. British Universities are legally defined as charities and as such they have a responsibility to consider the wider public interest. It is difficult to see how an initiative such as this which increases the power of academic managers is in the interests of staff, students or the wider public. Coventry University UCU joins the calls across the HE Sector for these changes to be withdrawn as soon as possible. Warwick UCU is very grateful to have received this statement of solidarity from Coventry UCU. STAFF OVERWHELMING REJECT MANAGEMENT REFORMS THAT THREATEN JOB SECURITY AND ACADEMIC FREEDOM. On 12 May 2017, members of academic staff at the University of Warwick voiced their overwhelming opposition to the university’s plans to gut its employment statute because of their concerns about the impact on academic freedom and job security. 97% of the assembly (over 140 people) voted in favour of a motion calling on the university to rethink its approach. The motion, proposed by Professor Jimmy Donaghey of Warwick Business School and seconded by Dr Jonathan Davies of the History Department, calls for the university to keep measures for redundancy and serious disciplinary matters within statute and for any changes to statute to be agreed through the democratic structures of the university, including agreement with the recognised trade union. Professor Donaghey noted that the proposed changes were “regressive” and would impair “the ability of academic staff to be free thinkers”. He also attacked the university’s claims of equity, arguing that the proposals represented “levelling downwards and not upwards”. In a strongly-worded statement Professor Donaghey challenged management to justify this “race to the bottom”. A string of speakers from the floor drew attention to various concerns particularly around academic freedom and ability of the university to recruit world-class scholars. No one spoke against the motion, even when explicitly invited to do so. Members of management, other than the VC who has to chair assembly meetings, were conspicuous by their absence. Professor Saul Jacka, one of the longest-serving professors and a member of Senate, drew attention to the fact that while the university’s proposals might be acceptable in times of benign management, he feared for what might happen if any future regime was minded to operate differently. Another speaker from the floor highlighted that since both sides were in clear agreement about the importance of academic freedom, it was important to consider whether the current proposals would extend or curtail academic freedom. He argued that they would inhibit the ability of researchers and teachers to ask those “inconvenient” questions which challenge received wisdom and thereby extend the boundaries of knowledge. Another contribution from the floor dismissed the university’s reforms as unnecessary and urged the vice-chancellor to build trust between academics and management which had suffered much damage during the previous VC’s tenure. 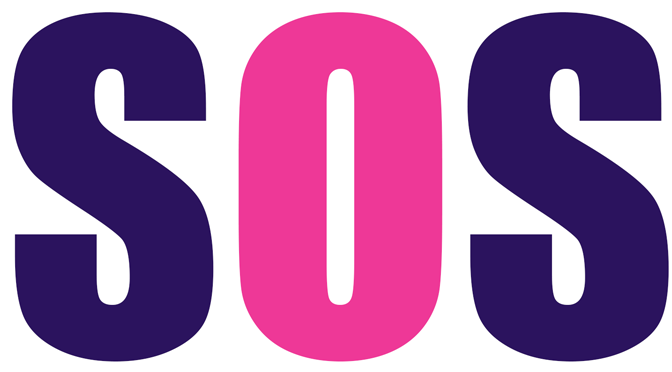 SOS: Assembly 12/05 – Register now. WARWICK ACADEMICS – ACT NOW! Stuart Croft, VC for the University of Warwick, has called an assembly on Friday 12 May (10:30 to 11:30 in Oculus 1.05) over the reform of Warwick’s Employment Statute (Statute 24). The changes to the Employment Statute being proposed by the Provost constitute a massive downgrading of the redundancy, disciplinary/dismissal, grievance and appeal procedures for staff on academic, teaching-only and research-only contracts. This is the most serious attack on academic freedom and job security since UK universities abolished tenure nearly 30 years ago. The assembly will vote on a formal motion calling for the university to revise the employment statute, instead of gutting it; and for Council not to approve any changes until they have the support of the affected staff, UCU, Heads of Department and Senate. The Law School and History department have already passed motions opposing the changes. Other departments are scheduling extraordinary staff meetings to discuss this one issue. The campaign needs everyone’s support. We can’t let down the next generation of Warwick teachers and researchers. We can’t let the legal safeguards that have protected Warwick academics for nearly 30 years get abolished on our watch. Direct people to the dedicated Warwick UCU Save Our Statute website. It has lots of information and an FAQ section rebutting everything in the official version. Talk to everyone in your department so they realise what’s at stake; use the flyers we delivered to staffrooms and pigeon-holes, as well as the UCU Briefing on Statute 24; You can print more or we can send some to you (click on the images above for PDFs you can download and print). Table a motion at your next departmental meeting asking your Head of Department to write to the VC and Provost outlining staff concerns. Several departments have already done this and the passed motions are now being sent to University management. Warwick UCU represents over 800 members of staff, so we shouldn’t have to act individually. But management aren’t listening, so feel free to provide feedback directly to emprelations@warwick.ac.uk.